Do you think you have De Quervain’s Tenosynovitis? I seem to have had a few patients come in complaining of a wrist pain at the base of their thumbs, especially with grasping and holding items in their hand. The condition causing the wrist pain for these patients is likely to be de Quervain’s Tenosynovitis. So what are the symptoms, causes and treatment options if you think you have de Quervain’s Tenosynovitis. Take a look at the de Quervain’s disease information below on what more I found out today about this inflammatory condition of the wrist. Swiss surgeon, Fritz de Quervain, in 1895 published 5 case reports of his patients with wrist pain. The paper was called “On A Form Of Chronic Tendovaginitis”. He found that they had a tender, thickened first dorsal compartment at the wrist. It was from this paper the musculoskeletal wrist condition was subsequently named, De Quervain tenosynovitis. A funny fact is Dr. de Quervain credits another doctor, Dr. Kocher, with the first description of the wrist pain condition and its first surgical treatment ¹. However, Dr. de Quervain is the famous one. So what anatomy in your body is causing this wrist pain. The two culprits are the tendons of the abductor pollicis longus (APL) and the extensor pollicis brevis(EPB)muscles. So the APL and EPB tendon sheaths become inflammed and cause the pain over the area of the wrist called the first dorsal compartment. 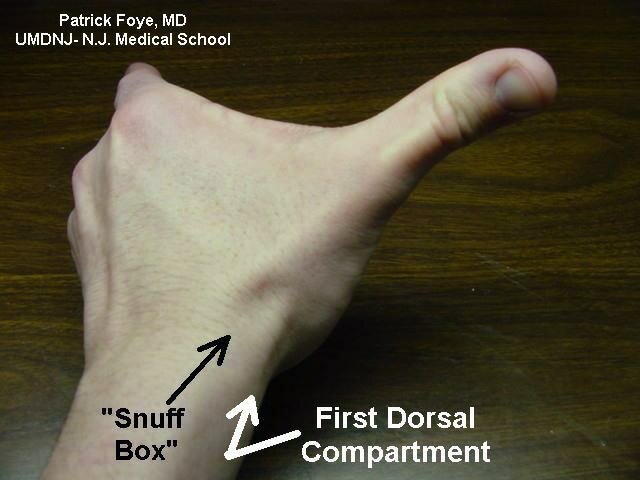 It is called the first dorsal because your thumb is the numbered as the first finger on your hand. It is very close to the anatomical “snuff box”. A septum separating the first dorsal compartment into distinct sub-compartments for the abductor pollicis longus tendons and the extensor pollicis brevis tendon is often noted at surgery. The first thing you are probably wondering is what is a tenosynovitis? De Quervian’s Tenosynovitis is an inflammation of the synovium of the tendon sheath. The synovium is a lining of the sheath that protects and covers the tendons. So again, the cause of the Tenosynovitis is inflammation. The source of the inflammation is likely to be unknown, or it can be a result of repetitive strain injury (overuse), trauma or an infection. Most cases of de Quervain’s Tenosynovitis are idiopathic (unknown cause). The tendon is inside of the tendon sheath. So De Quervian’s is not a tendonitis. This means in medical terms it should not really be called De Quervian’s Tendonitis. By definition a tendonitis is symptomatic degeneration of the tendon with vascular disruption due to a partial rupture of the fibers. This is not the case with De Quervian’s Tenosynovitis. The main symptom of de Quervain’s Tenosynovitis is pain. The pain would be over the wrist at the base of the thumb. Sometimes another symptom of a chronic de Quervain’s tenosynovitis is that the first dorsal compartment, over the radial styloid, becomes thickened and can be seen as a raised bump. As mentioned earlier, it is usually unknown why de Quervain’s Tenosynovitis starts. It has been found that mothers of infants aged 6-12 months tend to complain of the wrist pain condition. The pain for these mothers can be in both wrists. This is most likely due to the repetitive lifting of the child, which is getting heavier with age. Anyone who has had a direct hit or trauma blow to the first dorsal compartment of the wrist may also develop the wrist pain condition. The main way to test for de Quervain’s is an orthopaedic test called Finkelstein’s Test, which you can see in the video below. Other than that the story you tell the chiropractor or doctor helps. Occasionally an x-ray if an arthritis or fracture is suspected. So you have consulted an orthopaedic surgeon and they suggested either having a cortisone injection or the de Quervain’s surgery or maybe even using a wrist splint. You might be interested in the following videos below. The first video shows you the orthopaedic test called “Finkelstein’s Test” used to diagnose de Quervain’s tenosynovitis. The second and third videos go through an actual surgery on the abductor pollicis longus tendons and the extensor pollicis brevis tendon sheath. The fourth video is by Gary Moller talking about natural ways to try help and treat de Quervain’s tenosynovitis. A tendon takes longer to heal than a muscle. So you could expect to wait several weeks to try get the wrist pain to calm down naturally. If you are worried get an opinion from your chiropractor or doctor to see if it is a case of de Quervian’s disease. Hopefully you enjoyed learning a bit more today about De Quervian’s Tenosynovitis and if you are suffering from this wrist pain condition I hope you get some relief soon. If you found anything else helpful for treating De Quervian’s Tenosynovitis please leave a comment I would love to know your thoughts.